In a lecture yesterday, Federal Reserve Chairman Ben Bernanke made the mistake of talking about inflation during his critique of the gold standard, going so far as to say that when the barbarous relic was used as the foundation of our monetary system “over the medium run, it sometimes caused periods of inflation and deflation” (see this item from earlier in the day for links and other specifics). That struck me as a particularly odd way of addressing a subject that probably shouldn’t have been addressed at all and that prompted the creation of the chart shown below using data from … the Federal Reserve. Maybe it’s just me (after all, my background is as an engineer, not as an economist), but, the hard money days prior to the formation of the Federal Reserve sure seem to be a better alternative to what we’ve had over the last hundred years, inflation-wise, especially when looking at the slope of that red curve since the last vestiges of sound money were abandoned back in 1971. When you think about it, any sensible central bank chief serving decades after the launch of another experiment with pure fiat money really shouldn’t be talking about the gold standard at all. History shows that these pure paper money systems usually run their course after a few decades (sometime much sooner) and, depending upon how many terms Bernanke serves as Fed Chairman, that could occur on his watch. I mean, what’s the possible upside in calling attention to the gold standard in general and, in particular, to the inflation data under that system as compared to what we’ve got now? Former Fed Chief Alan Greenspan was careful to only make substantive comments about the yellow metal before (Gold and Economic Freedom) and after (Stunner: Gold Standard Fully Supported By… Alan Greenspan!?) he ran the world’s most powerful central bank and Bernanke would do well to follow that lead. 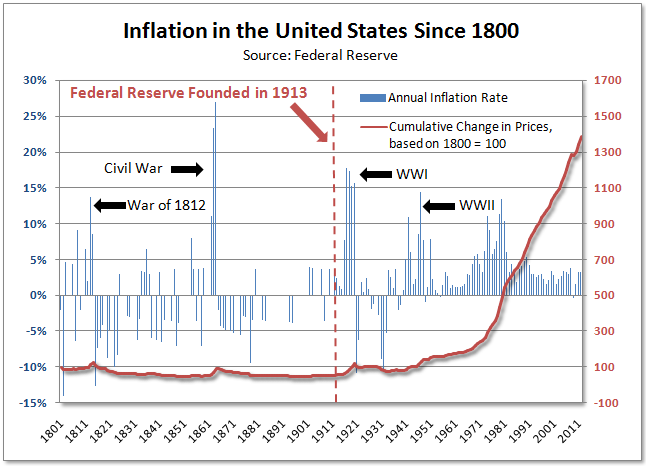 But, if our current Fed Chief feels as though he must talk about how returning to a gold standard would be problematic today (probably as a result of increasing calls from the public as they see rising prices everywhere but in the government’s statistics), he should probably just leave out the part about inflation. Tim Iacono is the founder of Iacono Research, a subscription service providing market commentary and investment advisory services specializing in commodity based investing.